A rescued weasel given a fresh lease of life by a Yorkshire wildlife artist is set to appear on television this week. The one-year-old mustelid was taken in as a tiny kit by Wolds-based Robert E Fuller after being found abandoned on Walmgate Stray in York. Fidget the weasel, who will be appearing on The One Show this Wednesday. Picture courtesy of Robert E Fuller. Having been nurtured as Mr Fuller’s pet ever since, the weasel, named Fidget for its restless nature, is now due to star on the screen during an episode of BBC One’s The One Show on Wednesday from 7pm. Fidget will feature in a short clip which shows him scampering about the artist’s gallery in Thixendale, North Yorkshire and completing an agility course. Mr Fuller, who is a regular columnist in Country Week, The Yorkshire Post’s weekend rural affairs magazine, said: “Fidget usually keeps me company whilst I’m painting, but he is so active that I’ve found myself building him things to climb on to keep him busy. The One Show crew filmed Fidget completing a Perspex maze in Mr Fuller’s studio. He quickly works his way through the maze then darts into clear plastic hamster tubing, over a bicycle wheel, onto a slalom and up a vertical wall before slipping behind Mr Fuller’s paintings and down a Perspex slide into a sock nestled between the artist’s paintbrushes. “Whenever he gets tired he has a nap in the sock, which is a bit like a comfort sock for him, and sometimes the cameras had to take a break whilst he rested,” Mr Fuller said. Wednesday night’s showing will not be Fidget’s first TV appearance. Aged four weeks, when he measured just 10cm, Mr Fuller took him into the Leeds studio of BBC’s Look North to illustrate a news article about weasels. 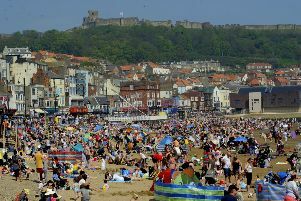 Is Scarborough to be another Benidorm on TV?